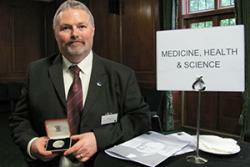 Professor Nigel John from Bangor University's School of Computer Science was presented with a Churchill medallion at a prestigious biennial award ceremony in London recently, after successfully completing his Winston Churchill Travelling Fellowship. Prof Nigel John at the event.Nigel was presented with a Churchill medallion by Guest of Honour, Dame Mary Peters DBE, Olympic gold medal winning pentathlete and a 1972 Churchill Fellow herself. Dame Mary presented 113 Fellows with their medallions at a ceremony in Church House, in Central London. Church House has significant Churchillian associations as during the Blitz, Winston Churchill requisitioned Church House as a makeshift Houses of Parliament after the originals had been damaged by bombing. It was also from Church House that he made his famous speech announcing the sinking of the Bismarck on 24th May 1941. As part of his Fellowship, Nigel travelled to Singapore and Australia to investigate a computer simulated virtual patient for training clinicians with a view to establishing new research collaborations in this field. Speaking about the Fellowship, Nigel said “The Travelling Fellowships provide opportunities for British citizens to go abroad on a worthwhile enterprise of their own choosing, with the aim of enriching their lives through wider experience – and to bring back the benefit to others in their UK profession or community through sharing the results of their new knowledge”. Dame Mary praised all the Fellows for their outstanding achievements, and said that “the Fellowship represents a wonderful opportunity to give something back to the community and others in the UK. We all have talents. Strive for personal excellence – doing ordinary things in an extraordinary way”. She also urged the Fellows’ to continue to follow their dreams, saying “it is attitude rather than aptitude that matters”.